This is a mixed loop that threads through the Sierra Azul Open Space Preserve. The fact that I'm naming the ride after one particular trail along the loop instead of calling it something like "Sierra Azul Loop" will, I'm sure, tell you that Kennedy Road is the most crucial part of this ride. Kennedy Road is a well-known climb for the mountain bikers in the South Bay. Perhaps I should say "notorious" instead, because it's a long and difficult one. The overall average grade of the climb (which I consider as starting half a mile after you start on the trail) is only 10%. But that includes a couple of short flat-ish sections. So, the grade of the steeper parts frequently hovers around 14% to 16%. And the climb is about 3 miles long. Kennedy Road also happens to be the route of a traditional Thanksgiving Day mountain bike climb. Coordinated through the "Norcal Forum" on MTBR.com, this ride is joined by riders numbering in the hundreds each year and is highlighted by a small-scale, impromptu outdoor festival at the top of the climb on the route shown on this page, with food and drinks way beyond what you'd expect on a typical group ride. See here for some photos from the ride in 2012. Little parking is available at the trailhead itself or along the road that leads there, so this particular ride starts by parking in Los Gatos. In addition, if you park closer to the trailhead, you'll have to contend with the "insult" of an additional amount of road climb to return to your car at the end of your ride. By parking in Los Gatos, once you finish the Kennedy climb, you ensure that it's pretty much all downhill until you reach your car. Of course, another way of ensuring that you won't have to do any climb as you return to your car is to park a little way back up the final descent of the ride. In this particular case, that would mean parking at a lot at the edge of Lexington Reservoir near the dam, or right at the trailhead where you'll be coming out of Limekiln Trail near the end of the ride. However, parking in downtown Los Gatos also means that you will have plenty of choices to grab a bite or a cup of coffee after the ride without having to move your car. The ride starts out with a long approach portion on pavement (about 3.5 miles). You also do 500 feet of the total climb along this road section of the ride. When you reach the trailhead of "Kennedy Trail" and start the trail portion of the ride, a climb starts right away but ends very quickly and is even followed by a coast down a gentle downhill. The "real" climb starts at about the half mile mark from the trailhead and you don't really reach its worst part until about 1.3 miles into the trail. There's a brief reprieve whose start is identifiable by an unmistakable large tree around which the trail splits into a small clearing. This spot also acts as a popular rest and regrouping spot for most riders. You still have about 45% of the total trail climb left after that tree and it resumes soon enough. The first spot where you'll find the climb end at a "hilltop" (immediately after an extra steep stretch) is actually the "false top". You still have a bit more climbing left after that, including two of the steepest uphill bursts (one very brief, the second one longer). The second of these last two steep stretches brings you abruptly to the end of the climb, at least as far as this particular ride is concerned. There's little at the end of the climb other than a short flat stretch, and you almost immediately turn onto Priest Rock Trail to start your descent. Priest Rock Trail loses elevation very quickly and is very steep in some places. One particular spot on Priest Rock Trail is nicknamed "Dogmeat" among local riders. You can make your own inferences from that. 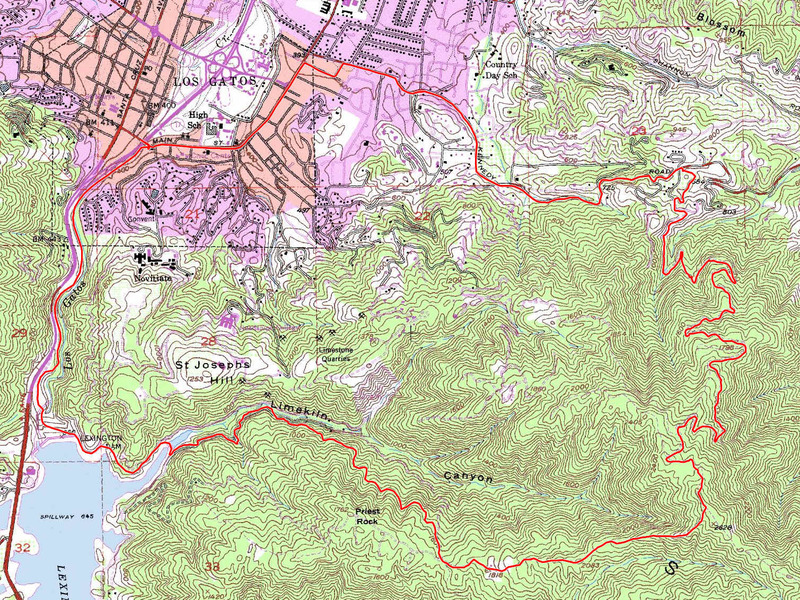 On this particular ride, you turn onto Limekiln Trail when you reach its junction, but taking Priest Rock Trail all the way to Lexington Reservoir is an alternate possibility. Limekiln Trail gets surprisingly rocky and technical in some sections (yay!) despite nominally being another fire road. Once you reach Lexington Reservoir, you take Alma Bridge Road to the wide, flat, and family-grade Los Gatos Creek Trail to follow it for a short distance before finding your way back to your parking spot. Los Gatos Creek Trail is a wide gravel path that is hugely popular with a wide variety of trail users. You might need some patience as you cover this portion of the ride on a crowded weekend.